It has been an interesting few weeks for ITC working with and forging new links in the Independent Theatre sector and it has coincided with an interesting few weeks in politics. I have been irresistibly drawn to reflect on what we in the independent theatre sector can learn from the ‘Jez We Can’ Campaign. For the last week of August ITC was in Edinburgh delivering free seminars, debates, surgeries and events in partnership with the Fringe Society and Federation of Scottish Theatre. The quality of questions and conversation with new young companies was inspiring. There are many motivated people around with great ideas and serious commitment to making work which challenges. We also took the opportunity of seeing a wide range of ITC members’ work, which was energetic, skilful, thought-provoking and refreshingly political in many cases. It feels as if independent theatre makers have their fingers on the pulse of the world’s issues and are not afraid to speak out. Things feel quite dynamic in our sector at the moment. Last week on 9/9 we ran an experiment – an ‘ITC virtual Open Day’. We opened up the members’ zone of the website, opened up our phone lines for free advice to non-members for 2 hours in the afternoon and managed an all-day Twitter Q&A. The level of engagement and enthusiasm for the event was heartening and invigorating and we encountered some great project ideas in discussion with some very driven practitioners. There’s a lot to shout about in The Independent Theatre Sector – this is where the good ideas are, the resourcefulness and initiative, the art form development and the genuine audience development. So what does all this have to do with Jeremy Corbyn?- Apart from the fact that he was the only candidate for the Labour leadership to write and publish a coherent arts policy. For me there is something here about hope, determination and the element of surprise. Corbyn came, literally from left field, from the relative obscurity of the back benches – he was identified as an outsider without a chance of being elected. Throughout the campaign he has been attacked and derided by press, media and mainstream politicians. He started the campaign apparently to put genuine labour left wing values on the agenda – who could have predicted his landslide win on Saturday? The most exciting thing about his campaign was the way in which it engaged people and reinvigorated the political debate. I’m not sure we entirely realised how comatose and bored we had become. The endless irritating squabble over the ‘middle ground’ of UK politics had sent us all to sleep and turned people off. Suddenly there is a polemic - something to breathe life into our dying democracy. My 19 year old first- time- voter daughter really struggled in the lead up to the General Election – she felt strongly the argument that people had fought and died for the right to vote therefore she should use it wisely and thoughtfully, but she said: ‘I don’t know who to vote for – I can’t tell the difference’. 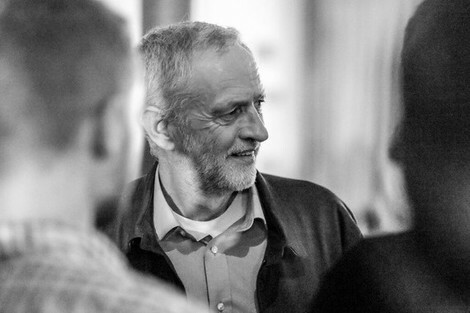 During the Corbyn campaign she said to me ‘I get now what the Labour Party is supposed to stand for’ - many young people felt the same and flocked in their thousands to his meetings. The word ‘Hope’ has been used an extraordinary amount in the past few weeks but I don’t think it is the naïve ‘hope’ that now everything will be miraculously better, that the horrors of austerity and inequality will disappear. It is the hope that comes of engaging in genuine debate, of expanding the parameters of that debate, of opening our minds to alternative possibilities. I have always disliked the phrase (apparently coined by Bismarck) that ‘politics is the art of the possible’ – it implies a tired acceptance of the status quo. We have been offered the opportunity to question the norms, the averages, the means of the so-called ‘middle ground’ and it is altogether more exciting. I think the Independent Theatre sector is good at this polemical engagement too. There is a big fight ahead in making the case for continued funding for the arts. I don’t think we will successfully make it by simply arguing for the status quo. We have to raise the profile of what is good and new and challenging - we have to be ready to turn things on their head a bit. The fact that Corbyn won is not the key issue (though I admit to being quite pleased) – it is that the theatre of debate has significantly shifted. Having elected the ‘unelectable’ let’s think the unthinkable, do the undoable, make the unmakeable. What Next? have produced an advocacy toolkit for the arts sector to use in making the case for the arts. The key message is that as many MPs as possible need to get as many personalised, individual letters, approaches, contacts as possible. Be persistent, engaging and surprising (and don’t be afraid to talk to Tories). Wanna full enjoyment then try to play this game and get full enjoyment pinochle free online video card tacking game and full enjoy thank for it. I want to know this as well, What can we learn from JezWeCan? The people from the help with accounting assignment were telling me about everything and I was pretty pleased with all that. Those writers are fantastic. Try not to consider the following thing or next objective, since it is currently and how you live it. It is important a great deal. Check collegemoka.com how they respond on it and I trust you get course.